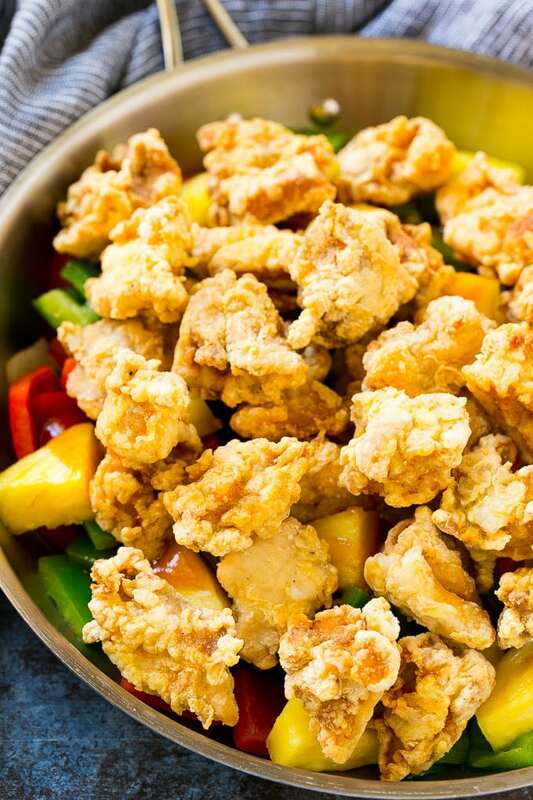 This sweet and sour chicken is full of crispy chicken, fresh pineapple and bell peppers, all tossed in a sweet and savory sauce. A classic Chinese food dish that tastes even better than the take out version. 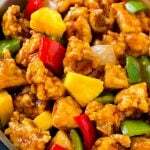 Sweet and sour chicken is a super popular dish, because that combination of crunchy chicken, sweet juicy pineapple and crisp peppers just cannot be beat. I make this dish at home at least once a month to get my Chinese food cravings satisfied, and my kids love it too. Serve it with fried rice or cucumber salad for a complete meal! There are always those classic dishes that seem to live on through the years because they’re just that good. Sweet and sour chicken is one of those recipes for me and I had to share my version that’s just as good as any restaurant. An easy and pleasing dish for the entire family. HOW DO YOU MAKE SWEET AND SOUR CHICKEN? The first step is to fry up your chicken. 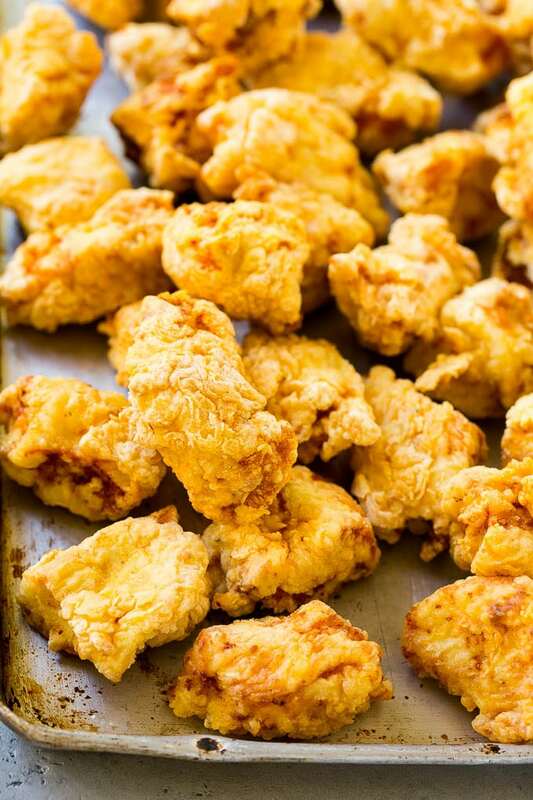 The chicken breast pieces are coated in a mixture of egg and cornstarch to get that ultra crispy coating. I used chicken thighs here, but cubed chicken breast will also work. Make sure you use a thermometer to check the temperature of your oil before you start frying, 350-375 degrees F is ideal. You can use fresh or canned pineapple, whichever you prefer. Looking for a healthier sweet and sour chicken? Skip the breading and deep frying and simply saute the chicken in a little vegetable oil. WHY IS THE TEMPERATURE OF THE OIL IMPORTANT WHEN FRYING? You want to make sure your oil is the right temperature, because if the oil is too hot, the outside may be done before the inside is cooked through. If the oil is too cold, the food will need to spend longer in the oil until it’s cooked through which means more oil will be absorbed into the food. CAN OTHER VEGETABLES BE USED IN SWEET AND SOUR CHICKEN? I love adding vegetables to my sweet and sour chicken. 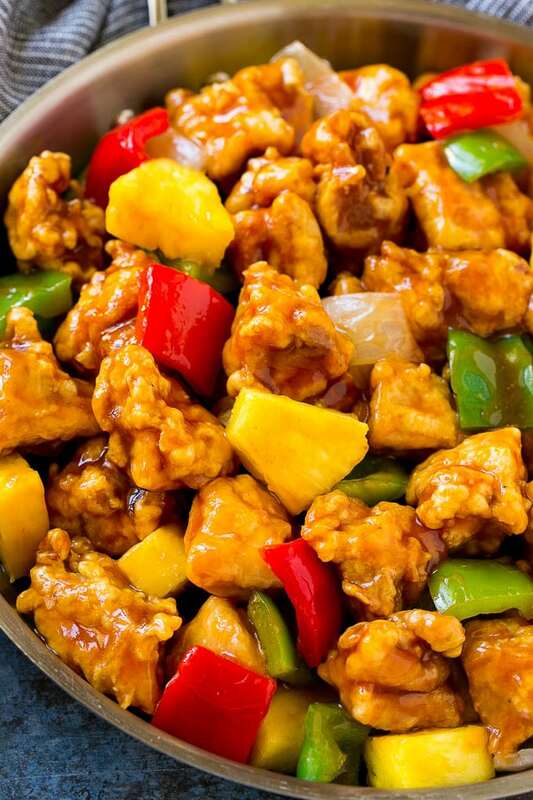 Traditional sweet and sour chicken contains onions, bell peppers and pineapple. You could also try adding sliced carrots or even mushrooms into the mix! I always get so excited making sweet and sour chicken because it’s one of my all time favorites. This dish is on our dinner rotation quite often and there are never any complaints. It’s an easy dish so it’s never a hard to make on a weeknight! While the chicken is cooking, heat 2 teaspoons of oil in a large pan over medium high heat. Add the bell peppers and onion to the pan and season with salt and pepper to taste. Cook for 4-5 minutes or until vegetables are just tender. Stir in the pineapple. In a small bowl, whisk together the sugar, cider vinegar, soy sauce, garlic powder, onion powder, ketchup and cornstarch. Pour the sauce into the pan with the peppers, onions and pineapple and bring to a simmer. Cook for 2-3 minutes or until sauce has thickened. Add the fried chicken to the pan with the peppers and pineapple and toss to coat with the sauce. Serve immediately. Yes you use both. The onions stay in they pan they’re not removed, I just edited the recipe to clarify! The coating on the chicken will absorb the sauce and get softer as it sits, it still tastes good but the leftovers aren’t quite as delicious since the chicken isn’t crispy. I just made this for dinner. Followed the recipe exactly, and everyone, including my picky 8 year old, loved it. Definitely a welcome addition to our dinner rotation. Thank you! This looks relly good. I never kknow how to make the batter/coating for the chicken. 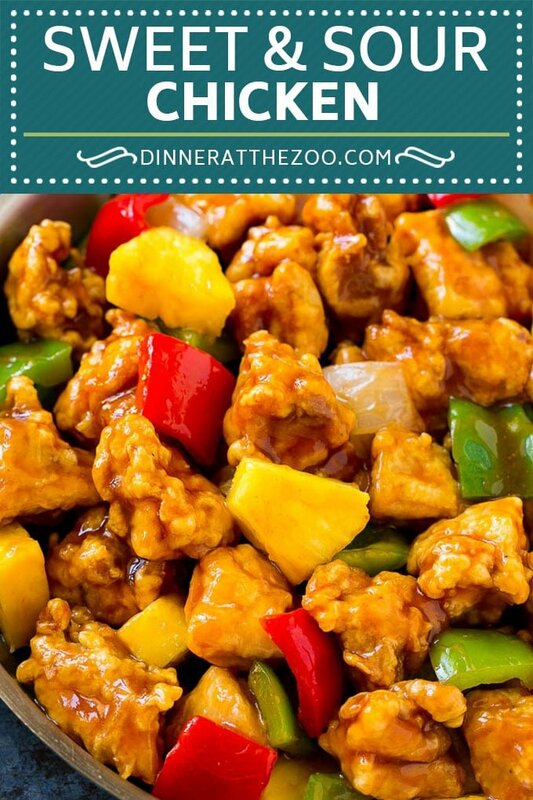 Sweet and Sour Chicken is one of my favorites! I can’t wait to try this, I am saving this recipe, thanks for sharing! YUM! I love Sweet and Sour Chicken. I love anything Chinese food, or any kind of Asian food… SO good. Oh, yum! This looks so good and delicious! We always order out sweet and sour chicken dish because we do not know how to cook it. lol! But I’ll try this recipe. I treat myself to this about once a month dining out. I am definitely going to treat myself more often now that I can prepare it at home. Yum! This recipe actually reminds me of the sweet and sour dish we regularly order from our favorite Chinese restaurant! I will have to try and make it. Sweet and sour chicken is one of my favorite dishes and seeing this photo makes my mouth watering and makes me really hungry. Love this! I’ll be adding this one to the meal plan rotation. 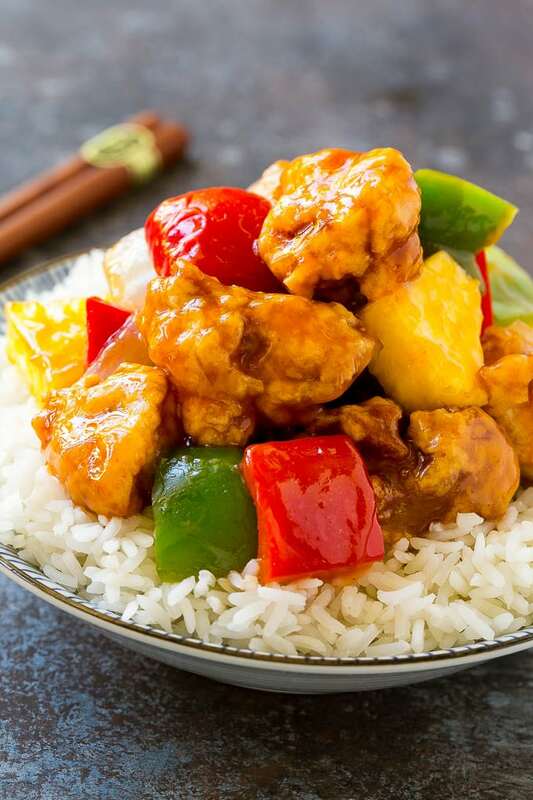 Sweet and sour chicken is one of our favorites! What a delicious dinner idea! 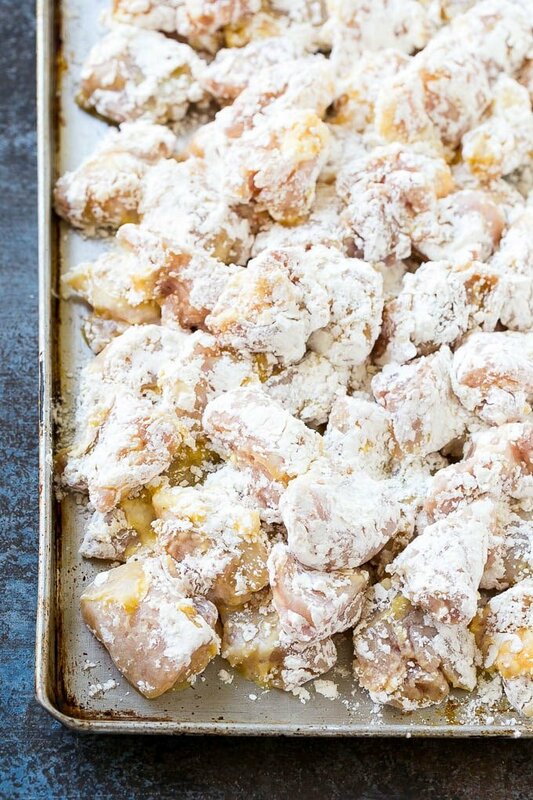 This sweet and sour chicken would be a hit with the entire family for sure. Oh yum, sweet and sour chicken is one of my favorites! Love your tip on making the chicken super crispy . . . no one wants soggy chicken that gets all gloopy in the sauce.